It’s December already! This year has really flown by and is my second Christmas at SGM. How time flies by when you are having fun :D.
Google recently released a link Disavow function, which you can use to remove links that you believe are negatively affecting your sites performance. Determining if you’ve been penalised can be more art than science, but if your site has clearly been hit with a manual penalty and you’re reasonably certain that penalty is negative link-based, and you haven’t been able to get those links removed, then disavowal may be of use to you. Emailing owners of sites with bad link signals can be a very time consuming and thankless task. More often than not you will not get a reply so if you are COMPLETELY sure that a websites links are affecting you in a bad manner then use this option. 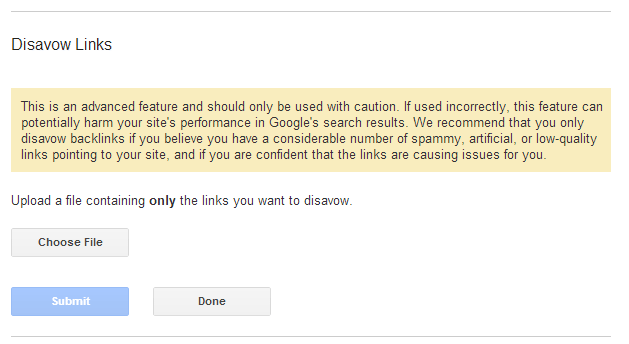 If you’ve been trying to resolve a link-based penalty for months with no success, then disavowal could be a logical next step. Google has never been very forgiving in these situations, and even if you’ve filed for reconsideration, they will often not take any action unless the majority of bad links have been removed. Sometimes reconsideration requests simply get you nowhere. So now you have one more option. If you think that you have been affected by a form of negative SEO then this could be a solution for you. For example, someone could have been building an unnatural number of links to your site from unsavoury sources with exact match anchor text and you have not been able to remove these. I will however say that while I believe negative SEO exists it is also extremely rare. A big number of people who think they have been affected by negative SEO are normally suffering from other problems on their site affecting their performance. So the motto here is check and check again or you could be potentially removing links passing value. Even if you’re sure that bad links are your problem, discovering exactly which links are bad is not an easy task. The problem is that most links, even low-value links, still help your rankings. So, if you start removing absolutely every link in question, you could be throwing out a lot of links that pass some (even if small) value. This tool isn’t directly available from the Google Webmaster Tools navigation. You have to be logged in with “Owner” level access and then enter the URL to the disavow links page. 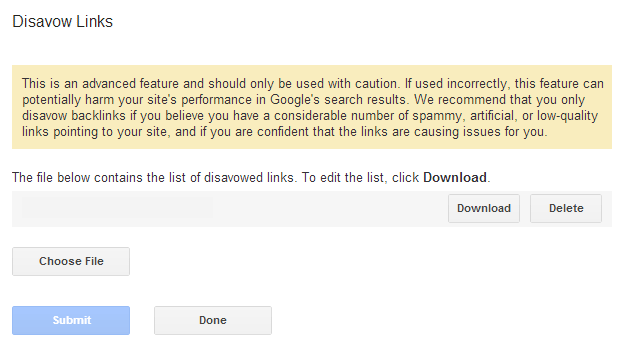 Before you continue, you’re going to need the list of links you want to disavow. Be very careful when using option #3 – you’ll end up disavowing every link from that domain, even the good ones if there are any. Google has also said that, while they’ll usually honour sub-domains, it’s a bit open to interpretation. If you have terrible link from a sub-domain you could also lose any good links from the root domain. So please be very careful. 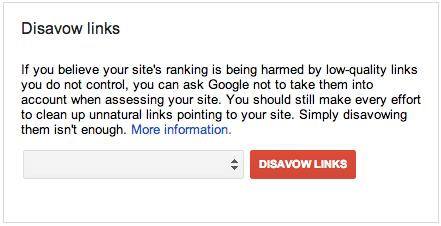 Go back to Google Webmaster Tools then click on [DISAVOW LINKS] and you’ll get a warning. Click on [Choose File] and browse to your file on your local computer (again, it doesn’t have to be on your web server). Name the file something you will remember when selecting the file of course. Click [Submit] and the screen will change. Thats it for now. If this is my only post this month have a great Christmas and New Year!! !